A Day Late and A Dollar Short: FreeTaxUSA Software 25% Rebate! As a single working Mom, I don't have the time or finances to pay someone to do it for me. So, I thought I'd share my find with you. For years, I've used FreeTaxUSA. 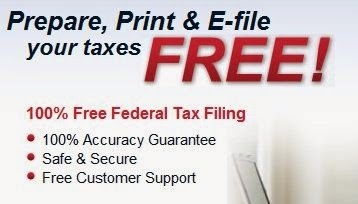 To file your Federal taxes, it's **FREE. ** To file your State taxes, it will cost you about $13 (before the code FREETAXUSA10, which will get you an 10% discount on that price). Here's the kicker. I just found FreeTaxUSA on ebates! ...and the best part? It's a BIG rebate -- 25%! So if you're going to use this free tax software, make sure you go through ebates first to get an additional 25% back! Remember, all those cash back rewards add up fast! Enjoy! *If you are not familiar with cash back sites, visit our cash back page.